The kids are getting big! 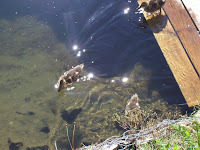 I pass these baby ducks on my way to the Prudential Terry Horrocks Real Estate office where I work. They were born this summer on Mirror Lake in Lake Placid, NY. I am happy to say it lovely here now that the nip of Fall is in the air and the leaves are starting to change. These ducklings, now in training and getting ready for the trip south this winter, are indicative of the changing season. The annoying bugs for which the Adirondacks are so famous have either died off or are full, and are no longer a nuisance. It was so nice and non-buggy last evening that porch time included outside yoga. There is something special about Fall in the mountains. Maybe it is because it gets colder sooner and the cold feels sharper, teasing us with temperature dips close to freezing. We get to smell wood fires and eat local apples that are crisp and fresh - in August. I know much of the United State is still in the thick of summer, but Fall is here in the Adirondacks. Thank goodness.